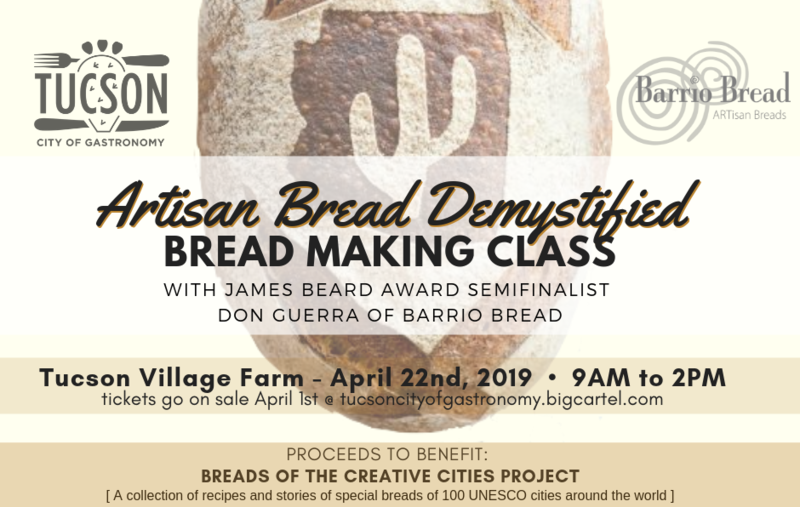 Tucson's very own James Beard Award Semifinalist Don Guerra of Barrio Bread is hosting bread making class to raise money for "Breads of the Creative Cities Project"
The hands-on class takes place at U of A Cooperative Extension/Tucson Village Farm from 9-2pm, the cost is $155. Participants will learn 2 different baking methods including sourdough management. Lunch and baking tools will be provided. Proceeds from the event will go to the "Breads of the Creative Cities Project" A collection of recipes and stories of special breads of 100 UNESCO cities around the world. TICKETS GO ON SALE AT NOON ON APRIL 1st!